When you are planning a wedding, the theme “less is more” often falls by the wayside in short time. Even if you are arranging a small wedding, you will often find that it very quickly becomes a major event. There are times when you should be looking to keep things as simple and as minimalist as possible though, and if this sounds appealing, the Floral Fantasy Wedding Invitation from Paper Themes is the perfect invitation for your special occasion. The design of the card is quite stark, with a single pink flower and a scattering of flower petals. The message of “You’re invited” makes sure that people know that there is a wedding taking place but on the whole, this is a stylish and restrained card that offers a great deal of class. The silver and gold foil overlay of the front of the card makes sure that there is a touch of glamour about the card but on the whole, this is a perfect card for people who are looking to keep things simple. You may even view the style as being evocative of a winter’s scene, and if you are planning a winter wedding, this card will be an excellent choice. While the front of the invitation has a simple style and approach, opening up the invitational wallet provides access to three separate inserts. This means that if you have a lot of information to send, you can provide all of the information you need on these three cards. The invitation, which can be fully customised, is included in a pocket on the left and the RSVP card and the guest information is contained on the left. 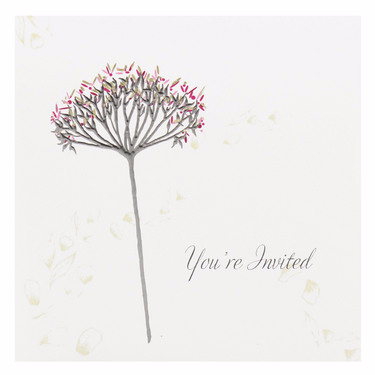 With a full range of stationery available in this style, you can co-ordinate all of your wedding correspondence.